This summer we've been talking a lot about time and events and looking forward. Planning ahead. How many days until we go to the beach? How many days until someone's birthday? How many days until it gets cold? With my stepmom in the hospital, I too find myself counting off the days. The doctors have diagnosed her with something called Acute Respiratory Distress Syndrome (ARDS), and it could be weeks or months before she comes off life support, regains consciousness and checks out of the ICU. That's a huge chunk of time. Sunburst has been filling in pre-printed calendar pages and putting together her own glimpse of the year. She's writing in the name of the months, the days of the week, and numbering the days. She's filling in birthdays and celebrations as she comes to them, and we'll bind it all up with string and hang it on the wall. It helps her to see ahead and really get a taste for how the seasons unfold and the map of our year is put together. She was delighted to look on her page for August and discover that today is my birthday. So for the last few days she and her sister have been secretly preparing. I woke to a birthday crown on my bedside table. 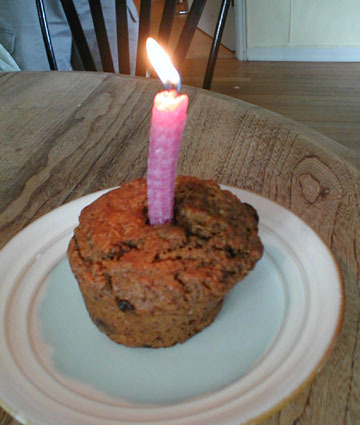 There were flowers, oddly-shaped packages, and a breakfast carrot muffin served with a hand-rolled beeswax candle. I appreciate their collective excitement, but this year I feel dismally prepared to embrace this day with so much going on inside my head and my heart. Really, it's an imbalanced state where the hands have nothing to do but wring themselves, helplessly, over and over. However, I find it eerie that my stepmom apologized a month ago for missing my birthday. She was really upset about it, and we both had a good laugh when I told her she was a month early. But now she really IS missing it... oh wonder of wonders! How did she know? Her health is still balanced on that precipice, and with a positive outlook, full recovery may take as long as six months. There's no choice but to keep on with our own paths, despite the heartache, despite the worry, despite the unknown. We have to keep moving forward. Which means... we must eat cake.